The name Marion King Hubbert is synonymous with the term ‘peak oil’, derided by many in the industry now that the ‘shale gale’ has taken hold. So this is a timely biography, giving a critical review of what Hubbert actually said, and an extraordinary insight into a life governed by data, logic and a fearless determination to discover truth. Hubbert’s life as a young student is exhausting to read: taking geology and physics with math as a minor, he worked several jobs to pay his way and he even became a published scientist while still an undergraduate. At 26 he was offered a post leading a new geophysics program at Columbia. This life-long drive for knowledge and understanding came from a family that revered education. Even his names, Marion and King, were both chosen to honor men who had personally helped his mother get to school. The physical world fascinated him. ‘It had never dawned on me that the world runs on mines,’ he wrote in his early 20s. As he began to study the coal industry, and as he watched oil companies tapping into the one big pool of the first big gusher, all fearful that another company might drain it first, the idea of ‘limits to growth’ entered his thinking. His method was always to ‘get his hands dirty with the data’ before reading the theory, whether considering mountain folds, hydrodynamic entrapment, how fracking actually works, or nuclear waste disposal. Hubbert applied the same relentless logic to the society he saw around him, the 1930s depression, the growth of corporate power and mass consumerism, the racial segregation and the profound economic inequalities of US society. He became a leading thinker and writer in the Technocracy Movement which saw the inconsistency and short-sightedness of government as a major block to progress and ‘fair consumption’. The group’s ultimate goal was the ditching of politicians and their replacement with science-grounded technocrats. Hubbert liked to joke that he was fraternizing with the ‘most dangerous radicals in the US’. Indeed, he did come under investigation as a potential subversive during the war period, and again in the McCarthy era. Only the fact that his skills were irreplaceable for strategic resource planning, plus his relatively low public profile within the movement, kept his good name. He moved from the civil service to Shell. Inman charts the difficult years when Hubbert began to draw his own conclusions on US and world discoveries and production. 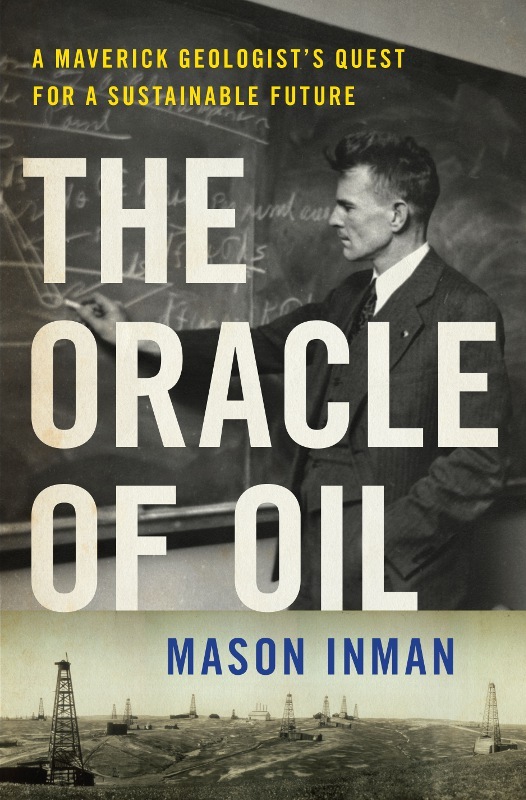 Through Inman’s eyes, we see some of the frustrations and sense of embattlement – as well as the fearless integrity and rigorous analysis – that led him to become an extraordinary, inconvenient thorn in the flesh of the energy establishment. This was true for the nuclear industry with its waste disposal policies as much as for oil, and the two together when nuclear explosions were used to heat up and release tar sands in Project Cauldron. Hubbert’s loud verdict was that this was ‘irresponsible and almost insane’. As Inman reminds us, Hubbert’s predictions were for US and world conventional oil and they have proved remarkably accurate – 1965-70 for US new discoveries and early 2000s for the world; around 12 years later for peak production. In the public mind, his predictions have become confused with the idea that the world was about to ‘run out’ of oil, which was categorically not his point. Indeed, he was well aware of shale and tar sand deposits and agreed that ‘they should be able to supply all of our domestic requirements for a century or two’. America would not become ‘destitute of liquid fuels’. His estimate was that each additional 50 billion barrels would delay peak production by approximately five years. But he simply did not agree with the ‘shaky speculations by poorly informed writers’ that the US could ultimately produce another 300-600 billion barrels. From Hubbert’s point of view, these calculations appeared to be based on a wishful thinking that was not founded in data. The oil industry still waits with baited breath to see how long the US shale industry will last and how transferable it is. What perhaps Hubbert did not foresee is the interaction with a complex finance system that enables an industry to function despite not covering its operating costs. Across the board, however, there is still enormous respect for the man who was relentless in his quest for fact and whose impact still resonates today. Inman’s biography is a must-read for truth-seekers everywhere.